From Oct. 1 through Dec. 31, fishermen in Illinois are allowed to use a specific technique to catch salmon that’s banned in several other states. Called snagging, the practice is used to catch salmon swimming into Chicago-area harbors from Lake Michigan. For decades, the states bordering Lake Michigan have stocked that body of water with chinook and coho salmon. At this point in their life cycle, the salmon have spent about four years in Lake Michigan and are returning to the harbors where they were originally stocked to spawn – and then die. “They’re stocked at about five inches, they go out in the lake and then when they mature they come back to where they imprint on the water when they’re stocked,” said Vic Santucci, the Lake Michigan program manager at the Illinois Department of Natural Resource’s Division of Fisheries. When the mature salmon return, they’re not eating, so snagging is used to catch them. This style of fishing typically utilizes a heavy weight with three hooks protruding from it. The name comes from the actions the fishermen take as they try to catch the fish: they whip and thrash their sturdy poles back and forth, hoping to snag a part of the salmon. 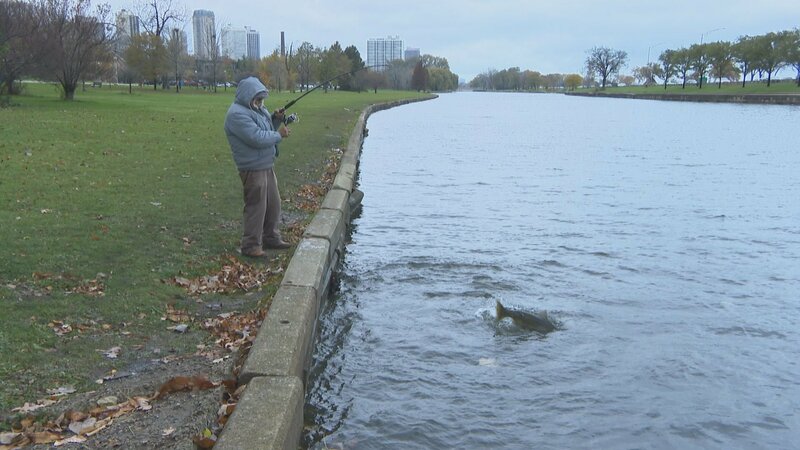 Snagging is only allowed at four locations in Illinois during its short season: Lincoln Park lagoon south of Fullerton Parkway, Jackson Park’s inner and outer harbors, the discharge area of the Winnetka power plant and the north basin of Waukegan Harbor. Some have called snagging inhumane; others say it conflicts with the ethical ideal of a “fair chase” since the salmon are not biting for bait. Poll: Do you think snagging is inhumane? But Santucci says snaggers are catching fish that would otherwise die and simply rot in the water, and that the season also provides an opportunity to fishermen who might not normally fish for salmon. If you plan on eating fish caught from Lake Michigan, be aware that some may be contaminated with PCBs – man-made chemicals known as polychlorinated biphenyls – and mercury. Read the Illinois Department of Public Health’s fish-eating advisory. Do you think snagging is inhumane?